Discover the art of rural west wales by visiting artists, and art galleries of Cardigan Bay. Workshops and group sand circle events available throughout the year. Learn to design and create large scale sand mandalas on the beaches of West Wales and beyond. Fine art, textile art reliefs and fashion design. 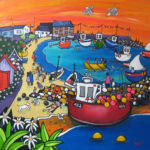 Chris Chalk lives and works as a professional landscape artist in Pembrokeshire. Using oils, Chris paints a wide variety of subject matter, including portraits and wildlife, however his main focus and passion is the beautiful Welsh countryside. Portrait artist Sarah Hope will be recognised by many from her appearances on Sky Portrait Artist of the Year. She works from her studio in Newport Pembrokeshire on both commissions and original paintings and drawings. Original Artwork & Hand Painted Cards for all Occasions. Gallery in idyllic rural setting. My intention is to provide a little bit of happiness and put a smile on your face. Open Saturday & Sunday afternoon throughout the year. Usually open all week, please check with us before calling. Award winning Aberystwyth Arts Centre is Wales’ largest arts centre and recognised as a 'national flagship for the arts'. 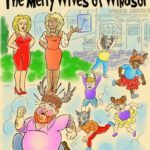 Falstaff is short of friends and down on his luck; that doesn’t stop him breezing into Windsor with hopes of the simultaneous seduction of two married women for financial advantage. The formidable Mistresses Page and Ford are having none of it, however, and the Merry Wives turn the tables. " O, what a world of vile ill-favour'd faults Looks handsome in three hundred pounds a year!" Mistresses Page One of Shakespeare's funniest comedies and with live music and spectacular stage effects, the Abbey Shakespeare Players' 33rd annual production will make the most of the atmospheric backdrop of the St Dogmaels Abbey ruins. Directed by Henry Morris Tickets will be available in advance from Theatr Mwldan, Cardigan Tickets are also available at the gate on the evening. This is an outdoor production so please dress warmly. Seating is provided.